A baby, a black hired hand, a bay horse, a gun, and a neighbor have all gone missing in the same corner of the Cherokee Nation West. Cherokee America Singer, known as Check, is none too pleased with these developments. As a wealthy farmer, the mother of five boys, and the matriarch of her family, she’s accustomed to wielding authority. And she’s determined to find out what’s going on. In the aftermath of the Civil War, complex alliances and simmering race and culture clashes unite and divide the people living on Cherokee lands. Tensions mount and violence escalates, and the long arm of white law encroaches further into Indian Territory. Determined to survive and thrive on their own terms after decades of betrayal and hardship, Check’s family, friends, and neighbors must come together to avenge a crime, outwit federal authorities, and protect their sovereignty. 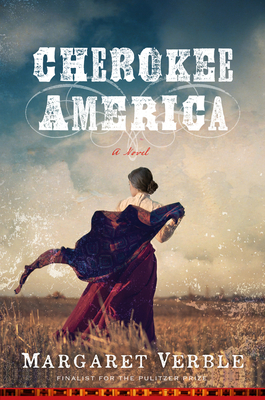 Inspired by Margaret Verble’s family history and written with dry humor and a lot of heart, Cherokee America is a different kind of Western, one told from a Native American point of view and with a mixed-race woman at its center. Check—member of a distinguished Cherokee family, daughter of a famous soldier and a slaveholder, wife of an abolitionist—is a necessary, revelatory addition to the literature of the American frontier. MARGARET VERBLE is an enrolled citizen of the Cherokee Nation of Oklahoma. Her first novel, Maud's Line, was a finalist for the Pulitzer Prize. She lives in Lexington, Kentucky.